Personally I don’t worry all that much about my iPad screen getting a bit scratched over its lifetime. I think it gives the whole thing some character. You’d also be surprised at how good the latest glass they use for screens has become; I have an article elsewhere on the site that talks about what makes one brand of this glass, Corning Gorilla Glass, so special. Still, if you are 100% determined to keep your device’s screen pristine or you are very concerned about impact damage to the screen, a good screen protector may be just the thing to calm your nerves. Screen protectors have also come a long way in the past few years. You can now get products that also take advantage of specialized manufacturing methods such as those that produce Gorilla glass and are now easier to install than ever. If you can follow instructions well and aren’t too clumsy, that is. To be honest, you’d be hard pressed to tell the difference between one protector and the next and if you are lucky you will never be in a position to find out if you bought a good one or not. But here I’ve paid special attention to people who have had accidents and how each product apparently held up. I’ve chosen products based on how popular they are and have put the ones that I think are the best first. The rest are in no particular order. In advertising they have a term called “puffery”, which refers to claims or praise that no reasonable person would take literally. As far as puffery goes you don’t get more “puffy” than a picture of your millimetres-thick glass sheet stopping a bullet; a bullet that still has the whole casing attached so perhaps it was thrown by hand, which would be more believable. OK, so I get that this is visual language for the product being “bulletproof”, but I still found it funny when I saw the marketing material. While this protector is marketed at being for the iPad Pro 9.7, it is also compatible with the Air 2 and Air 1. This makes sense since they are all 9.7” and have the home button in the same place. We are reminded, however, that this is not compatible with the 12.9” iPad Pro. If you needed to be told that I would suggest that not only are you unqualified to operate an iPad, but perhaps you are also unqualified to use a spoon safely. 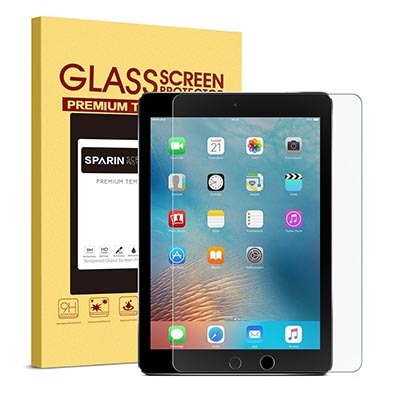 SPARIN says the installation is easy, which I have no reason to doubt, but they also say that the protector adds “no thickness” to the tablet. Look guys, just put the word “almost” in there to be safe. Even if this product was one atom thick it would still add thickness. This is made from very hard tempered glass, so the level of scratch resistance should be right up there. Another thing I really like is the inclusion of rounded edges, so that there is no chance that you can cut or hook your fingers on the protector’s edge. They also offer a lifetime warranty. All in all this seems like a really good buy and if I were looking for a protector for a 9.7” iPad Air or Pro this is probably what I would buy for myself. It seems that the people who have bought this product also agree and it is very well regarded. My respect for Anker’s products has been growing for quite some time and I’ve noticed that more and more people regard the brand as one that represents quality. 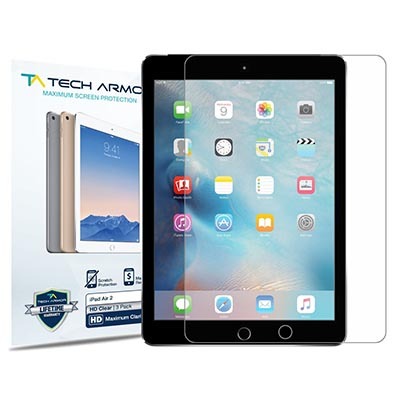 While tempered glass protectors are not hard to find for the larger iPad models, I haven’t seen all that many good ones for the smaller iPad models. So this product by Anker is very welcome indeed, although if you own the Mini 4 or newer you are out of luck and can move on to the next product. Like many premium tempered glass protectors, the Scratch Terminator is pretty damn hard. Anker claims it’s harder than a knife, but I’m certainly not going to test that claim myself. At a third of one millimeter this is definitely a very thin product and Anker claims that 94% of the original light comes through, which means that you won’t notice the difference. Like the screen that it covers, this protector is also resistant to smudging and fingerprints. The package is surprisingly complete. It comes with the protector itself as well as an alcohol towelette, a microfiber cloth, dust removal strip, and two home buttons stickers – one for each possible face color, either black or white. It also has that all important rounded edge feature, pretty important on a sheet of ultra-hard glass a fraction of a millimeter in thickness. The price is not the lowest I’ve seen, but I think given the satisfaction level of people who have bought this, and the reputation of Anker, it is probably worth it. The thing about screen protectors is that you can’t wait for them to go on special; you need them when you need them. It would be nice if one’s need coincided with a sale though. If I had an iPad Mini, this is my choice of protector. If there is any iPad that I actually thinks needs a screen protector it is the massive iPad Pro 12.9”. More screen surface means a much higher chance of getting a nasty scratch or impact damage. On the other hand, the bigger the screen the more nervous I’d feel about messing up the installation of the protector. Putting one on an iPhone is tricky enough, putting it on a 9.7” iPad is downright scary. A near 13-inch screen? I’m not sure I’m emotionally ready for this. Still, assuming that you can get it on without the world ending, this is very much worth considering – not just because the top-end iPad costs an absolute fortune, but because any scratches on such a big screen will be much more visible and therefore much more annoying. Larger screens also suffer more from drops, so you really want to give your big iPad Pro a fighting chance. Like all the best tempered glass protectors, this one has a rounded edge and at 99% boasts the highest clarity claim that I have yet seen. The lifetime replacement warranty should also assuage any excessive anxiety about screwing up the installation and breaking the glass. Although this protector is slightly more expensive than those made for 9.7” iPads, it’s not as expensive as I’d thought it be and for under 20 bucks I think it is rather affordable, considering that it is an accessory for a thousand dollar tablet. Still, there are already plenty of happy customers who have bought this product to protect their investment. Most of them are lyrical about this product, and with Tech Armor’s reputation it is certainly not surprising. People who have bought this note that it is thankfully easy to apply and that it doesn’t interfere with the Apple Pencil, which in the case of the big Pro iPad is a major consideration. Tech Armor has done a great job providing a protector for a weird new product right out the door. If you are worried about scratching up that lovely 12.9” screen you shouldn’t hesitate to put down your dollars for this protector. This is one of the most popular and best-selling screen protectors out there. Tech Armor says that their product caused almost no distortion, no rainbow effect, and no bubbles. To this effect they offer a lifetime warranty. According to the marketing materials there are five layers that make up this screen protector, the thickest being the optical bit. There are different variations on this screen. You can have it in “HD Clear” or with an anti-glare surface. 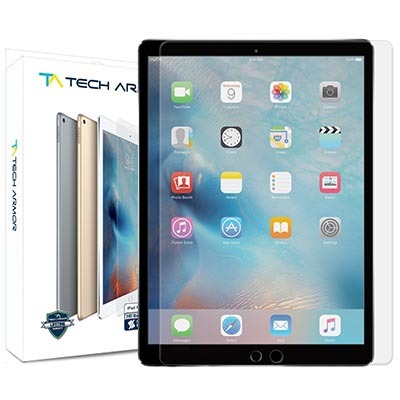 If you find glare is an issue in the environment that you use your iPad Air, then that may be a good choice. As to the actual protection level of the product, people seem to like it. Those who have dropped or otherwise suffered a misfortune say that it did its job with no trouble – which is really all you want. The other part of the puzzle is whether it really is hard to apply. I have a terrible time applying these things and many have gone straight to the bin before I decided I didn’t care, but hats off to Tech Armor. Their customers seem to fit the protector without any hassle, and apparently the company has some of the best after-market service in the business. 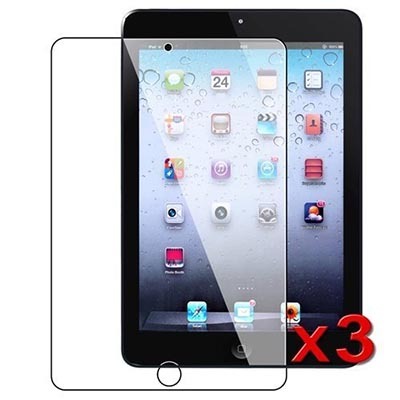 For less than five bucks you can have no fewer than three of these iPad Mini screen protectors from Etech. They’ll work with the first three iPad Minis, so if you’ve been building up a collection of old iPad Minis this may be a chance to give them all a new screen protector. That is, if you can get it on in one go. I suspect the reason we get multiple protectors in each pack is because screen protector manufacturers know that it takes a few tries before you get the application process right. Apart from the three protectors you also get a cloth to clean everything, presumably before and after application. Etech also promises that if you have to remove the protector there will be no sticky residue. The reasons they can claim that is that this type of protector clings to the screen with static electricity. Unlike liquid application protectors there is no stickiness at all. A lot (and I mean a LOT) of people have bought these and by and large they are happy with them. They are really well-cut and precisely fit onto the iPad. There are, of course, accounts of things going wrong, but overall that seems to be down to user error, although the instructions are not that great and if you have never put one on you’d do well to visit YouTube first. If you’re an iPad Mini owner I think these cheap and effective screen protectors are probably worth your money, and if you get it right first time you’ll have two spares. OMOTON is a brand I have never heard of personally, but this product has all the same claims as other tempered glass protectors in this size. Oil resistant, harder than a knife – you’ve heard it all before at this point. 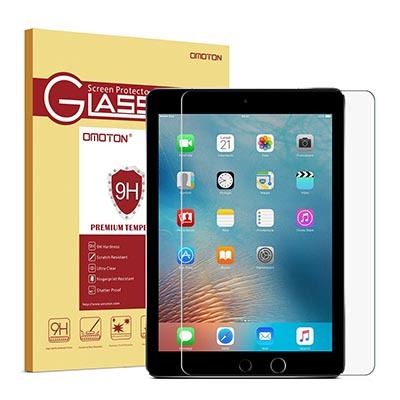 OMOTON claims a slightly higher clarity rating at 96%, but other than that I would have a hard time telling the difference between this and the 94% protectors. I can’t say more than buyers rate it very highly and I can’t tell the difference between this and anything else on the market. Should you buy it? Why not, it’s only 10 bucks. I have to say that screen protectors have come a long way since the last time I have given them a serious look-in. The ease of application has gone up a lot, prices are down, and static cling products have basically made sticky protectors a thing of the past. While I still think that most people shouldn’t bother with a protector unless they are obsessed with getting every last dollar of resale value, if you are going to get a protector at least it isn’t the frustrating chore it used to be to get it on the tablet. 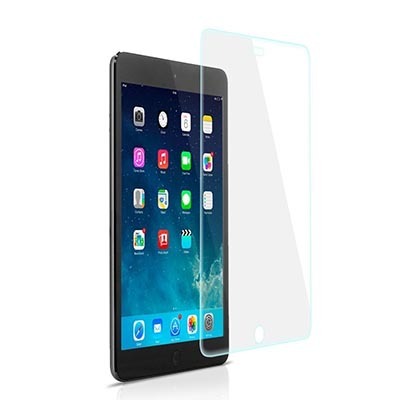 It seems that issues around picture distortion and clarity have also been resolved by the advent of affordable tempered glass materials. You’d be hard-pressed to tell the difference with the protector on and off. So I guess for the paranoid or the clumsy or the “actually I have to work somewhere rough and dangerous” people out there, now is the best time to buy a screen protector. The good news is that, if it turns out you don’t like it you can just take it off again.